Happy New Year! My sister told me yesterday that she was rereading her journal from the year, and I thought that was such a great idea. We often jump into resolutions or what’s to come, but it’s so important to look back and reflect on the journey. I’ve got a long to-do list for 2017 as far as house projects, but I wanted to take a moment and share some of my favorite projects from 2016. These are some of the top projects based on your views – thank you so much for following along on my journey! This was my second-favorite project of the year. 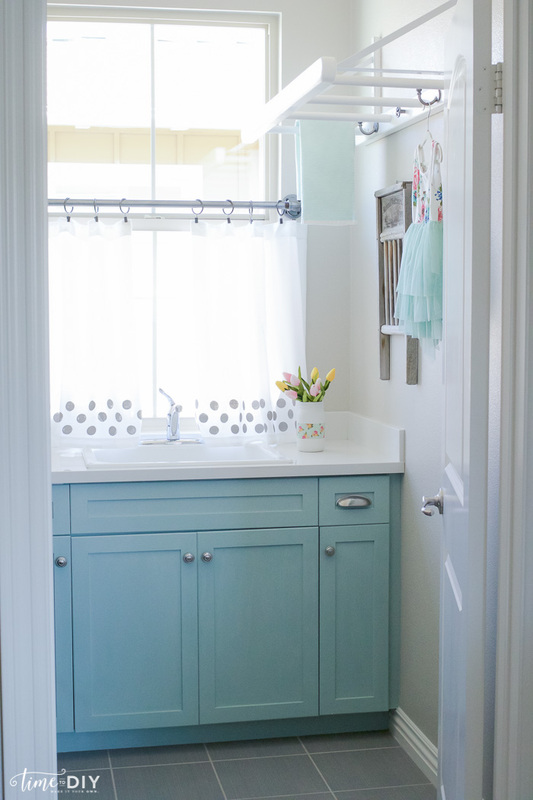 I finished the laundry room with a mounted ladder for laundry hanging, painted cabinets and DIY polka dot curtains. I don’t love doing laundry, so it was important for me to have a pretty space, and it’s nice to feel like one room in our house is basically finished. 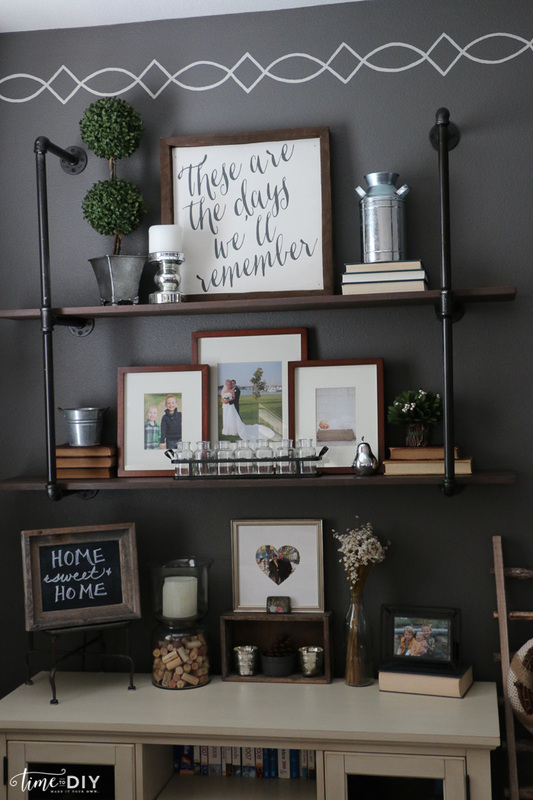 We have a big TV wall and didn’t want to tackle built-in shelves so I’m thankful for Joanna’s easy industrial pipe shelves idea. We flanked both sides of the TV, and I love how it finished the room (well, sort of. I’ve got some other plans with wall treatment 😉 and gives me lots of shelfie space to decorate. I’ve gotten a lot of request for the gray color (love it! ): Benjamin Moore Kendall Charcoal and I stenciled the border with my own design. 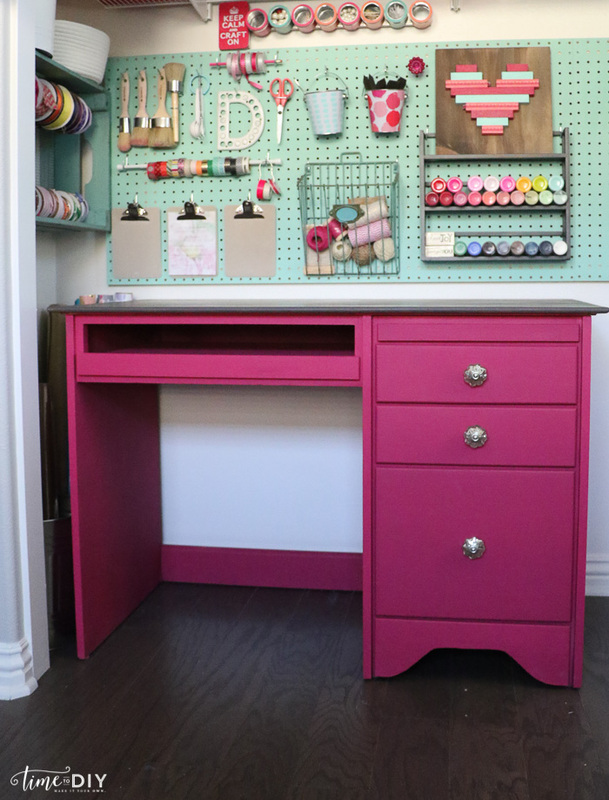 This desk was the inspiration for a craft closet makeover with pegboard and shelves, and this is what earned me a trip to the Michael’s Maker Summit in September! Although I haven’t finished the whole space yet (and now I’m considering a color scheme change), I did share the pink desk makeover. 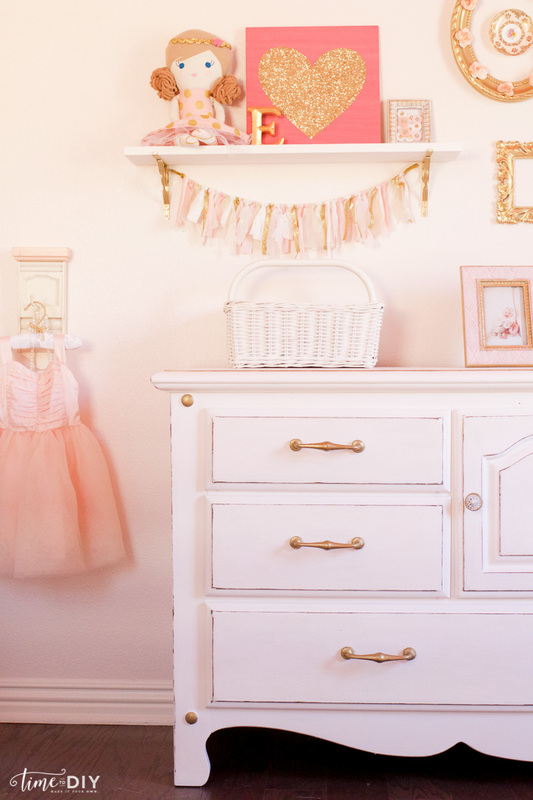 My top project of the year was my daughter’s nursery remodel for One Room Challenge. I had six weeks to convert the space with paint and decals, furniture makeovers, a tea table set, a gallery wall and a reading nook. It was such a fun one, and my daughter loves it. I recently converted it to a big girl room, which I will be sharing soon. And her chippy glam dresser makeover was another top project for 2016. I used BB Frosch chalk paint and metallic gold to give it a vintage glam look. For 2017, my main goals are organization (and decluttering) along with some wall treatment/decor ideas. In March it will be two years since we’ve been in our house and I’m now starting for figure out what systems we need to function a little better. This week I’ve started converting our butler’s pantry (which used to be a coffee bar) to a command center. We’ve got two boys in elementary now and there are so many activities to keep track of, and the worst part is all the paper! So I’m coming up with ways to tackle that clutter while staying organized. Here’s to some fun DIY projects in 2017! Thanks again for following along with me.